Nearing what could be the end, or hopefully simply a lull, of this round of fighting in Gaza, it is important to take a step back, look at the big picture, and see what Israel if anything has achieved in what it should have achieved. Throughout this latest conflict I have published several articles discussing various aspects like Kerry’s intervention and The Tactics and Strategy and The demonstrations and Media. I have also covered, the Obama administration’s position and attempt to pressure Israel, and Israel’s flawed PR efforts. Gaza Background, What IS Gaza? In this last area specifically, it has been painful to see a massive (relative to its size) international movement of “Pro-Israel” sentiment mobilized largely to no end. Jews and non-Jews alike, around the world flocked to social media to post an endless stream of often creative messages (broadly accurate but not always) whose sum total was “Hamas is mean!”. These messages would point out that Hamas was shooting rockets at Israel, or that it (or supporters) had faked a picture for propaganda purposes, or that Hamas used human shields, or that it oppressed Muslims under its own jurisdiction, or that it was overall just really really mean. Sometimes these messages, though reflexively accepted as fact by the pro-Israel side, I don’t believe surpassed a certain logical threshold any critical viewer might have. For example we had the ubiquitous aerial photographs showing Hamas rocket launchers near a houses, perhaps a school and usually a mosque. The type of image commonly shown by Israel on Hamas in Gaza’ accurate but lacking in depth. This message I found firstly a bit pretentious as there is an underlying implication that “we” ie the pro Israel camp care more about our enemy’s mosques than they (fervently religious Muslims) do. But in any event… These images in fact show nothing more than an expected reality. I don’t discount their value in educating people completely ignorant of what Gaza, Hamas and Israel are but they fail to convey any deeper message. In fact they place some doubt on Israel’s narrative. Why? In short, obviously any launching site in Gaza that is near any buildings at all, certainly any that are within Gaza city or Khan Younis, will be near homes, schools and mosques. That is what the buildings in Gaza are! They do not have random “dedicated rocket launching” buildings. This does not mean to say that this does not prove a difficulty for Israel, in trying to avoid civilian casualties, and that such civilian casualties help international pressure gather against Israel, but we must not make the mistake of losing all capability of objective reasoning when applied to our enemies. Much as they often do towards us. Other similar messages were equally puzzling, for example the image or video showing a Hamasnik using an ambulance to escape an airstrike, in knowledge that the IDF would not blow up the ambulance. Well, duh… who wouldn’t do that? Would we expect Hamas fighters to drive around in trucks with a bull’s-eye painted on the roof? A man trying to avoid a missile to his face is liable to be resourceful; a reverse complaint would be that the Hamas fighter would yell out that it is unfair that the Israeli pilot is using an F-15 fighter-jet and shooting laser guided missiles at him from safety instead of coming down and meeting him in a knife fight. For the one possessing the F-15, to complain about the one trying to avoid the missile strike looks good to no one but those who are already blatantly and thoroughly pro Israel. In the same tradition, Israel consistently stated that when civilians were told to evacuate to rear areas, since the IDF wanted to operate there, Hamas urged people not to comply. Again, we accused this action as terroristic and more of “Human Shield” activity. Imagine the chutzpah, an enemy who does not cooperate with your destruction of him! A people defiant of an enemy army coming at them. It is true, the defiance here is mostly in the nature that again, Israel does not want civilian casualties, and if rather the IDF was acting like some in the media implied, and simply killing people indiscriminately, you can be sure the Gazans would prove no more heroic than is human, and would have fled in panic. But still, the fact is that the lack of civilian compliance to the IDF hindered Israel’s efforts, and thus was a benefit to Hamas. Certainly if Hamas simply had ordered Israel to evacuate Sderot and the rest of the Eshkol region because it meant to launch rockets to there, and would prefer hitting only military personnel, it would be as equally unthinkable to imagine Israel would comply with this order, as it would be for reasonable people to consider it a use of human shields. Israeli campaigners, must realize that it is not only not reasonable for Hamas to refuse to cooperate with Israel’s efforts to destroy it, but that the average intelligent world citizen can notice that, even if we cannot. Again, as I often point out in my articles, these are messages empty of substance, of meaning, and most importantly of demanded action. Yes, Hamas is mean, yes it is a terrorist organization, great, and ??? If it instead of millions of Jews wasting millions of hours declaring in various imaginative forms… that Hamas is mean, they had demanded that Israel’s government, responsible for the safety of all Israeli citizens and Jews around the world, act upon the very right it kept saying it had (that of defending itself) and carry out this war to a successful victory, their efforts would have been infinitely more worthy. The opposition’s calls are clear, they were an unending demand for Israel to stop its operation in Gaza (which it continuously and consistently did in an endless chain of cease fires). The Pro Israel group had no such demand in return; it was merely content to point out that Hamas does not seem to like Israel. Point taken. Israeli definition of “War” = A series of ceasefires, which the enemy may or may not accept, in which part of your armed forces attempt to destroy tunnels while under fire, and the other part hangs out at the border areas providing the enemy opportunities for mortar target practice. This was Israel’s Operation Protective Edge… the very name implies an incredible mediocrity, not worthy of having the power to command courageous men to battle. Men, leaving their families, careers and lives behind with unbelievable trust in the political leaders (whom they most likely did not vote for) to know what they are doing. The courage that these men have, who as happens every time in Israel heeded the call in overwhelming and hard to imagine rates, was not respected nor returned by the government. The government thus far has sent the IDF into Gaza up to an arbitrary line, from where all they could do is stand and be targets of ambush, mortar and machine gun fire, IEDs, booby traps and of course the latest Russian made anti-tank missiles. The enemy meanwhile, was free, after recovering from the initial shock of the IDF’s assault, to regroup in the areas within Gaza the politicians deemed off limits, use the vast tunnel systems to launch hit and run attacks at the stagnate IDF, and subsequently return to their safe areas. While the IDF stood in place, against all common sense military doctrine while giving up its famous superiority to Arab armies in mobility, speed and tactical surprise, it was of course ordered to fight a war against the tunnels. Having defeated these (the known ones anyway), Netanyahu withdrew the abused civilian army claiming victory over the tunnels despite nearly 70 casualties, while ignoring both the potential of victory and risk of defeat by the enemy everyone else thought Israel was fighting; Hamas. This concept of “War against the Tunnels” captured the western imagination, because, as an extension of the “War on Terror”, we no longer are able to name our enemies who in fact are people and instead declare war on all sorts of other things. I have written on that previously as well. As can be seen, Israel so far failed in promoting a meaningful PR campaign, and more importantly, it has thus far failed in the war against Hamas, a group who is militarily insignificant compared to the IDF, because the political echelon either does not have the will to order a victory, or does not believe one is achievable. Either case is quite unfortunate. Disagree? This was a great blow against Hamas? The government is certainly stating so. Today, we hit Hamas strategic targets precisely. We have significantly debilitated their ability to launch rockets from Gaza to the center of Israel, and we are now working to disable their ability to launch rockets towards the south. 140 smuggling tunnels, 66 terror tunnels, dozens of Hamas operation rooms and bases, 26 weapon manufacturing and storage facilities and dozens of long-range rocket launchers and launch sites. Barely a year and a half later, it hardly seemed that Hamas’ long range capabilities were significantly damaged, in fact they were significantly improved with a striking never before seen range and volume of fire. Neither is their willingness to fight apparently. Whatever it is that Israel does to them, doesn’t seem to hurt too much. Now we are a midst Operation Protective Edge (or is it over? another costly failure? ), above was mentioned Operation Pillar of Defense , and before that we had Operation Cast Lead in early 2009. Hamas was badly stricken, both in terms of its military capabilities and in the infrastructure of its regime. Its leaders are in hiding. Many of its members have been killed. The factories in which its missiles were manufactured have been destroyed. The smuggling routes, through dozens of tunnels, have been bombed. 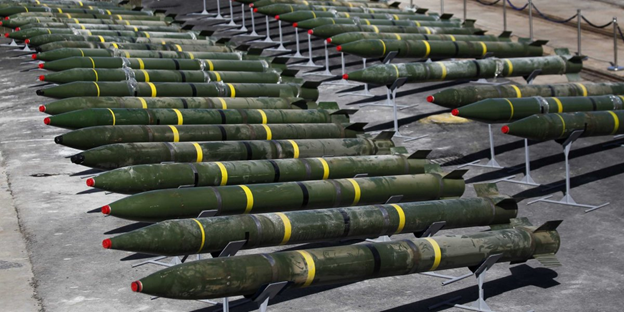 The Hamas’s capabilities for conveying weapons within the Gaza Strip have been damaged. The scope of missile fire directed at the State of Israel has been reduced. The areas from which most of the missiles were launched are under the control of IDF forces. The estimate of all the security services is that the Hamas’s capabilities have been struck a heavy blow which will harm its ability to rule and its military capabilities for some time. Rocket fire resumed immediately, but at a slower volume initially. Thus the partial “lull” was a bit longer than usual though by 2011 rocket fire was again in full swing. Today, and in large part due to the success of the military operation, the entire international community is ready to mobilize in order to achieve maximum stability, and knows that, for this to occur, the process of Hamas’s strengthening must stop. To this end, we reached a number of understandings – the importance of which cannot be underestimated – which will ensure that the strengthening of Hamas will decrease. We formulated understandings with the Egyptian government with regard to a number of central issues, the realization of which will bring about a significant reduction in weapons smuggling from Iran and Syria to the Gaza Strip. • On Friday we signed a memorandum of understanding with the American government, in the framework of which the United States will mobilize to take the necessary steps, together with the other members of the international community, to prevent weapons smuggling by terrorists in Gaza. In general, there has been a dizzying and comically tragic endless proclamations by every leader and all sorts of ministers and Israeli statesmen, that Israel under no circumstances, “will tolerate” rocket fire from Gaza (and/or Lebanon). When did this Israel began this policy of “not tolerating”, when did the rocket fire start? Well, wholesale and in the case of Gaza, it started as soon as Israel withdrew from the last parts of the Gaza Strip in 2005 (these areas were populated by Jews only, and they were forcibly removed) and critically from the Philadelphia corridor (the border with Egypt, through where weapons are smuggled). In smaller volumes, it started as soon as Israel withdrew from Arab populated parts of Gaza back in the early 90s. However, as long as the IDF had some presence within the strip, and controlled the crossing with Egypt, these were kept to a minimum (compared to today’s situation in any event). Israel will respond very harshly to Palestinian terror attacks committed during and after the disengagement from Gaza. After a pullout, Palestinians could no longer explain violence by saying that Israel was occupying their land, and Israel’s responses (to violence) would be much harsher. Nothing new under the sun, at least nothing new in the Israeli policy of “not tolerating” any further attacks, and always believing that after “just one more withdrawal”, if the Arabs continue their terror, THEN we can respond severely with the world, having seen our goodwill, on our side. Nothing of the sort ever happens. But why the current government’s reluctance to deal Hamas a crushing blow, to topple it from its rule in the Gaza Strip? Netanyahu was weary of entering Gaza in a ground operation, and despite the political pressure of an upcoming election, and despite widespread support for a ground operation, in late 2012 Netanyahu resisted the pressure. As seventy thousand reservists were called up by the Netanyahu government, I wrote in 2012 about the dangers and opportunities that the situation presented. And imagine…. Having doing it again less than 2 years later?! I really hope I don’t find the need to quote this yet again in another couple of years! Israel’s sacred weapon of a citizen army, is not to be abused; and if you are going to unsheathe it, it must be with clear purpose and with the willingness to be as steadfast in purpose, as the men being sent into battle. Likewise, it is strategically beneficial for Israel to not have the PA control Gaza, a West Bank / Gaza split is important in in ending the decades of destruction the Oslo era has brought down on Israel, and in certain ways, a Hamas control is preferable to a Fatah control. And on the other hand, an incursion that causes casualties on both sides and then ends without visible effect or purpose, is likely even worse. As was noted in my articles on the matter then and now, Egypt under Morsi (the Muslim Brotherhood) and back under the more secular army (2012 vs now) is a very different animal, and this parameter alone changes the strategic picture. Because of these and similar reasons I suspect, Netanyahu opted to not authorize the ground invasion. Yet with more time to prepare, more lessons learned, and more time to think, here we are less than 2 years later, falling into the same error. This time around, Netanyahu did unleash the IDF, but only partially, with extreme limitations, and sent them into a tunnel destroying mission while her enemy fought a war. But these complications along with others are merely part of the set of parameters and conditions Israel must take into account in its strategic thinking; it would be a grave mistake to think that nothing could be done – nothing could be further from the truth. And shortly, we will examine one such plan that Israel should have and can still implement in this latest round of violence in 2014. First, a look at some of the looming background issues. Some may be inclined to think that a low risk strategy that at least moderately punishes the Hamas regime in Gaza is preferable than a more risky one. “So what?” they will say, if every few years they have to get pummeled again. The truth is that dangers in this “strategy” are much greater than the obvious and apparent ones. The latter ones being along the lines of the desire to avoid frequent warfare, casualties, economic costs and the like. One more substantial threat that has been well discussed elsewhere is the loss of deterrence. Israel, surrounded by the hundreds of millions of people in the Muslim World, does and must rely heavily on deterrence. Losing that capability can press Israel into a vice, where from every front it is worn down by attrition until it loses its strength and economic wherewithal to hold back the onslaught. But absent from the discussion are less dramatic and more pragmatic military considerations. A long observed though almost never defined feature of conflicts is that the longer they go on, the more the two sides will resemble each other. This has not only terrifying moral and cultural implications, but also equally vexing strategic ones. A superior military force is able to deal a crushing blow to an inferior one, if the “friction” or contact between them has been minimal. But if the stronger side engages the weaker one in prolonged conflict, it will in fact tend to steadily weaken and the weaker side strengthen. Now there was long war between the house of Saul and the house of David; and David waxed stronger and stronger, but the house of Saul waxed weaker and weaker. The stronger side can be worn down by attrition and demoralized. But more importantly, it “learns” and adjusts down to the new level of enemy, while the enemy trains and improves to the higher level of his own foe. Much like physical entropy, and mixing a bucket of hot water and one with cold water; they will simply both equalize at an intermediate temperature. For an extreme example for the reader who still is not convinced, imagine the few Spanish conquistadors who conquered mighty and massive Indian empires (Aztec, Inca for example) in the New World. Put aside the debated reasons for this (guns, germs and steel as it goes), it was possible only by sharp decisive encounters. Had the Spaniards given enough time to the native populations to learn to ride horses, shoot and make firearms, and gain a resistance to European diseases and recover their population numbers, it certainly would no longer have been possible for a band of a few adventurers to take down mighty empires. For example, today, it is hard to imagine a Spanish army being able to conquer much if any of Central and South America. And to continue the wave of analogies, for the militarily weaker side, it is an almost biological and evolutionary phenomena, much like how bacteria learn to become immune to certain anti-biotic if the contact with them is not decisive but prolonged. To ground it in the current conflict, what the IDF can destroy from the air has been destroyed, since 2005, the lessons for Hamas have been clear, dig deeper and dig more. In the latest and current “War Against the Tunnels”, tunnels in Gaza that began from 1 and 2 kilometers from the Israeli border were largely destroyed by the IDF. But those if any that stretched into downtown Gaza city and central Khan Younis… are or would be intact. Israel has made it clear since Operation Cast Lead, that it will not venture into Gaza city proper, not into any of the built up urban areas, and not seize the entire Gaza Strip. So the tunnels, need only be a bit longer, to stay out of the IDF’s reach. As discussions with participants have confirmed to me, neither in Cast Lead nor in this current Operation Protective Edge, has Hamas been able to mount what would normally constitute a proper defense. On both occasions, any attempts at “holding the line” quickly evaporated as the IDF rolled forward. There hardly were any true “battles”. The casualties Hamas is able to inflict are largely based on the IDF’s political constraints. Hamas has sanctuary in the territory that the IDF is forbidden to advance into, and is free to ambush, snipe and booby trap from. Hit and run tactics that take their toll, particularly when their countermeasures are out of bounds politically. However, the military performance of Hamas has been significantly better in this round, than it was during Cast Lead, where much of the world was shocked to see the thousands upon thousands of Hamas rank and file fighters, simply melt away when faced with the IDF’s advance. Hamas had divided the strip into brigade sectors, and counted at least on paper with well over 50,000 fighters (Izz ad-Din al-Qassam Brigades, other security forces, Hamas-run “police” and fellow terror organizations such as the PIJ Al-Quds brigades); even more counting the Hamas (and Hamas-leaning clan) armed street gangs that keep control of local areas for Hamas. In the event, Hamas’ performance was quite dismal, any semblance of formal resistance melted away, and large numbers of desertions were reported. Some unlikely top Hamas leaders were found dead near the front line, apparently in an attempt to encourage resistance among their men who had simply ran. In other cases, it was demoralized Hamas fighters who were left leader leaderless as midlevel and even junior officers abandoned the battlefield. The IDF suffered 13 fatalities during Cast Lead, the vast majority due to friendly fire. If Hamas had thought they were a formidable army, merely because their armed and masked gunmen could parade the streets of Gaza by the thousands, they had been mistaken; and if they thought they were Hezbollah, they missed the mark by a wide margin. However, the failure during Cast Lead to achieve total victory and impose a new set of realities in Gaza, allowed Hamas to learn and grow from its mistakes. As a result of its poor performance, Hamas relieved at least two brigade commanders on Iranian advice, Bassam Issa and Imat Aakel (though politics as usual, played a part), and reportedly stripped 100 fighters of their membership. In what is unusual in Arab regimes, the organization decided to initiate a thorough investigation of the conduct of its fighters during the operation. Hamas’ leadership modified its tactical doctrine. The Qassam Brigades intensified military training at its various training camps and military academy in the Nuseirat refugee camp. The new training was thought to be more offensive, with a focus on hitting the rear of an IDF force (which has now been happening). Hamas relied more heavily on Hezbollah operatives for the training and rearming, than the academic Iranian experts that has been in charge prior to Cast Lead. And in contrast to the pre-war period, these efforts were kept quiet, in sharp contrast to the typical parades of hardware and gunmen Hamas frequently loved to put on display prior. But perhaps much more important than all the above, Hamas realized that IDF’s main tool would be an aerial bombing campaign, since ground troops would not enter deep into urban areas. Firstly, it let them know which areas were safe zones, where command centers, weapons caches, regrouping areas and staging points were safe from ground troops, and they only need be made safe from aerial attacks. This was achieved by either digging, placement along with civilian infrastructure or both. 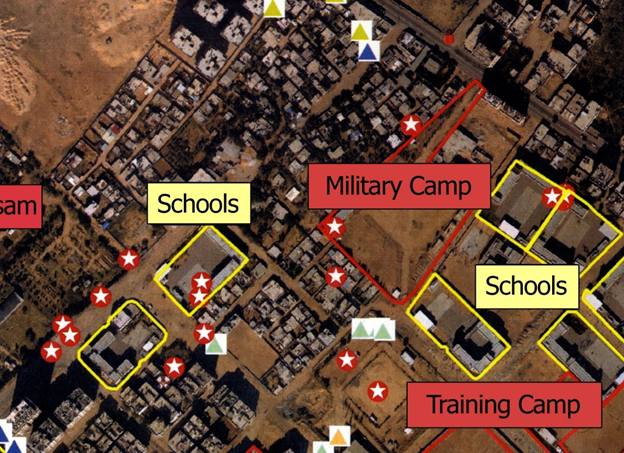 The most visible example would be Hamas’ command center during the conflict publicly being at the al-Shifa Hospital in north Rimal, near the western central area of Gaza city. There the Hamas leaders not only commanded their men from perfect safety, as Israel would not bomb a Hospital, but unashamedly held a string of press conferences and interviews for the international media; who mostly refrained from of course mentioning this interesting fact. Again, and as discussed earlier, I am less concerned about screaming out that Hamas, a terrorist organization, violated this and that rule of war, including the placement of the stated command center at the Hospital. Firstly it should be no surprise that a terrorist organization does so, its entire modus operandi of targeting civilians is against the acknowledged rules of war, and secondly it hardly is illogical for Hamas leaders to not want to get blown to bits. What is more important, is to note the improvement and their tactics, and ask that the IDF counter them effectively, and not merely complain about them. Besides recognizing these safe zones and the importance of digging, Hamas underwent a massive program of tunnel building. These tunnels, began as a means for Hamas to arm itself across the Egyptian border and soon became its lifeline. A Hamas takeover of the Gaza strip was not possible until Israel abandoned the Egyptian-Gaza border (the Philadelphia Corridor) and these tunnels came into full force. Likewise, a Hamas takeover in the West Bank has not been possible, because the IDF continues to control its border with Jordan. After gaining some mastery over their clandestine creation, Hamas soon realized that they could burrow under the Israeli border as well. This could serve not only for smuggling across that border (and to and from the West Bank), but for offensive and defensive attacks on Israel. Gaza soon became a maze of bunkers, tunnels and tunnel shafts. Since Hamas fighters could not stand against the IDF, nor maneuver around them to outflank it or stage attacks behind enemy lines, all difficult and complex operations requiring skill, training and courage largely beyond its forces’ capabilities, they would simulate these feats by use of the tunnels. With their many shafts, Hamas forces could suddenly appear on either flank or either side of an IDF force, and most dramatically as we have seen, appear beyond the Gaza border in Israel proper to perpetrate what has thankfully so far been avoided by the IDF tireless watch; a massive terrorist attack on the civilian centers in the Eshkol region. After these hit-and-run attacks, the Hamasniks could vanish back into their tunnels and escape an IDF response. Hamas’ improved capabilities are unfortunately clear to see, from 6 total combat losses the IDF suffered during Cast Lead, they stand in the dozens this time around, with a total fatality count near 70. Few of these occurred in any pitched battle, and they have been largely the result of tunnel-aided ambushes, anti-tank missiles on infantry mobile command units (early in the war I spoke about the IDF’s need to end use of those ), some sniping, and of course rocket and mortar fire launched freely into the masses of IDF troops in the border staging areas who endlessly waited for the government to make up its mind about either winning the war, or sending them home. Still they are casualties largely made possible by Hamas’ change in tactics from previous rounds, and Israel’s repetition of them. An old military maxim claims that nations often make the mistake of training to fight the “last war”. Lessons are learned from the previous conflict and inevitably used in the next one, where they may or may not (and most often do not) apply. Incredibly, Israel has given Hamas the opportunity to retrain and strengthen according to the lessons of the last war, and then fight it again. Likewise the rocket industry in Gaza is a far cry from what it was at its beginning a decade ago. The original range of less than 10 kilometers has consistently increased to hundreds, leaving the majority of the country (Israel) under attack. Similarly, Hamas leaders not killed or captured in one conflict grow more experienced and are emboldened for the next one. How can Hamas improve after this round of fighting if it does not get knocked out? Most importantly Hamas has seen that the tunnels are a great success and its efforts there will be redoubled. Intercity, Intracity, short, long, deep, large and small – all sorts of tunnels will be built. Smuggling tunnels, defensive tunnel networks more networked, more fortified, deeper and stronger, and of course longer offensive tunnels into Israel. All Hamas has to do we have taught it, is make the tunnels into Israel longer. Since the IDF refuses to occupy the urban centers even temporarily, longer tunnels will be a great success. Now any critical reader might say… well sure but certainly the economic costs on Gaza these adventures cost will deter them from wanting a next round. Yes so we are told over and over. Remember the $500 million dollars of damage Israel boasted about not 2 years ago in Operation Pillar of Defense. Hamas does not seem very deterred to me. This economic argument in truth, is actually reversed. It is Israel that suffers economically form these bouts of fighting in Gaza. The call-up of reserves, the halt of tourism (currently the high tourist summer season in Israel took a huge blow due to the conflict), economic devastation in the southern region due to rocket fire and to a lesser degree country-wide. Perhaps most importantly, the amount of munitions and taxpayer money used on the operation itself, mostly in the form of air-to ground missiles, and in the expensive Iron Dome missiles Israel uses to intercept the cheap homemade Qassam rockets being fired at her is truly massive. These does not “stimulate” the economy in any shape or form, because like Obama’s failed stimulus programs, they are a net drain on the economy, fueled by wealth seized from the citizens in taxes, government debt and/or inflation, and giving no tangible benefit in return (a broken building in Gaza is no service of any kind to any Israeli). If they did, Israel should just build and blow up missiles in sealed warehouses for economic growth. Meanwhile, the complete opposite is true in Gaza. The devastation that these operations have left in Gaza is truly remarkable; partly due to the nature of war despite Israel’s best efforts, and partly intentional as a “deterrent”. Amazingly, they serve not only as great PR fodder for Israel’s detractors, but also the base of an amazing subsequent economic Hamas and terror boom. The idea is that if buildings were used to house Hamas fighters, rocket launchers or weapons caches, Israel destroying them will cause the civilian population to not cooperate a second time. This not only ignores the more important cultural and emotional feelings involved in this matter; the “pride” many Gazans feel when little Gaza and small Hamas stand up to the might of the IDF when whole Arab states mobilizing all their vast resources simultaneously could not defeat her in battle. But putting those more complex issues aside, the deterrence in pure economic terms is a sham. If your house was destroyed in the service of Hamas, you can be sure you will be more than well compensated by Hamas and its sponsors, and whether it was destroyed in the service of Hamas, or without any relation to it, you can in either case expect a great load of help from the international NGOs. After each round of fighting, international humanitarian organizations descend on Gaza with endless millions of dollars for reconstruction. Much of these is diverted into Hamas hands, and the rest causes a building boom in Gaza. Secondly, the more open and direct sponsors of Hamas such as Iran, Qatar, Turkey and Syria in better days, unleash a wealth of funds directly into the hands of Hamas. Either for a job well done and/or to improve for a better job the next time around. Islamic charities across the world also increase dramatically their support for all sorts of causes in Gaza, from good to bad, after each round of conflict. The combination of these massive sources of funds in tiny Gaza is nothing short of an economic boom, albeit a very corrupt one, where Hamas leaders and cronies become millionaires. These funds not only fuel the rebuilding and expansion of the civilian infrastructure, but also the terror infrastructure and re-arming of hamas. This is why the Israeli pubic and apparently Israeli leaders are left dumbfounded at the speed at which Hamas rearms and extends is capabilities after what everyone was told was a “devastating blow”. And unlike the case of false stimulus by government spending, which has to use either the confiscated wealth already in the population, or create it by inflating the currency, the Gaza stimulus is a real one, fueled by funds that come from outside of Gaza and thus a real net gain. Ironically, Israel would slightly benefit economically from trade in this boom, due to the large import of cement and other materials that follow, but since Israel did not defeat Hamas, it maintains its limited sanctions on the border, and so much of these goods are imported legally or illegally (the smuggling tunnels) through the Egyptian border. In essence Israel’s limited incursions and attacks on Hamas held Gaza, do nothing but maintain and fuel an economy and way of life dependent on further conflict. How true and pervasive is the Israeli claim that Hamas fires rockets aimed at civilian populations? We already saw above at how absurd and repetitive Israel’s claims of “no tolerance” are in respect to these rockets. Let us take a look at this closer. 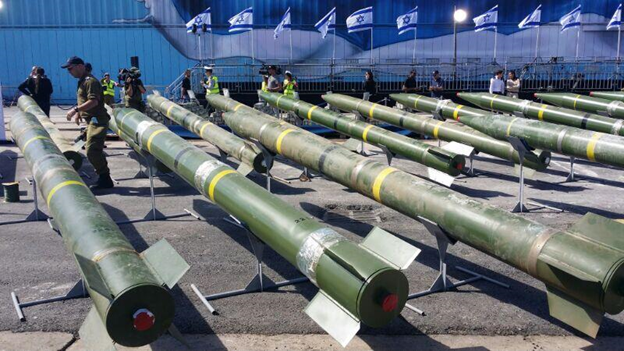 Hamas has 3 generations of Qassam Rockets, each subsequent model with larger payloads and longer ranges. 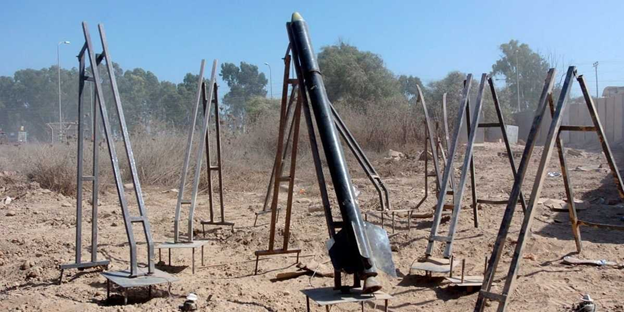 The Rocket fire from Gaza mostly consists of Hamas’ own improvised Qassam rockets, and longer range foreign Grad rockets. They increasingly include longer range models, Syrian, Iranian, Chinese, North Korean and Russian models such as the Fajr-5, WS-1E and Grad type Rockets, as well as locally made (or Sudanese made) variations of these such as the Khaibar M-302. M75, R-160, and the J-80. Again, Israel has spurred and encouraged this nascent industry. The local Qassam is its third generation with Qassam-1 rockets with a range upwards of five kilometers while carrying a five kilogram warhead, a Qassam-2 can fire upwards of 12 kilometers carrying a 10 kilogram warhead, and a Qassam-3 can fire upwards of 16 kilometers carrying a 20 kilogram warhead. In addition to the rockets, mortars are routinely fired at Israel from Gaza, along with a range of terrorist attacks from attempting kidnappings to Sniper attacks and incursions into Israel. The rocket statistics are a clear case study in appeasement. These are the numbers of detected rocket attacks (not individual rockets, which is a higher number) against Israel from 2000 to the end of 2009. 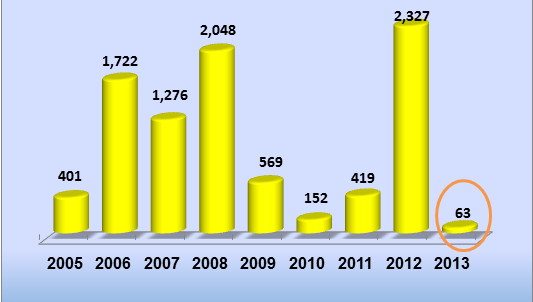 Total Rocket launches from the Gaza Strip to Israel between 2000 to 2009. Virtually unheard of before talks of the 2005 Disengagement. As is easily seen, they were virtually unheard of before the Disengagement Plan was a looming reality. In 2004, as Sharon pressed on his political wranglings to enact his disengagement plan and the expulsion of 10,000 Jews from Gush Katif, the rocket fire started to gain in frequency. In fact, it was this rocket fire that was a powerful reason used for the Israeli withdrawal. The public, as usual, was told and convinced that if we just remove the disputed Gush Katif Jewish settlements, and leave an entirely and unarguably Jewish-free Gaza Strip, there would no longer be any reason for the Arabs to continue firing. It was the presence of Jews in their midst, that insulted them, and so the beautiful communities of Gush Katif had to go. Moreso, if the Arabs continued their terrorism and their attacks after the withdrawal, then Israel would have the full right and international support to exact a crushing blow (a thing never quite defined). In either case, the rocket fire should cease. No statistician is needed to observe the trend that after the 2005, Disengagement, 2006 showed an exponential rise in the amount of rocket fire. Encouraged that their minimal attempts back in 2003 and 2004 led to an Israeli withdrawal, they redoubled their efforts to gain further Israeli appeasements. The high rate of fire is pretty consistent for 3 years, devastating the southern Israeli communities, despite the Israeli government’s promise that the Disengagement was to end these attacks. Finally, after a record high number of attacks during 2009, Israel launched Operation Cast Lead into the Gaza strip, severely curtailing the number of rockets that fell subsequently in 2009, though never completely stopping them. Whereas withdrawal and appeasement had increased attacks, retaliation had drastically diminished them. How successful or long lived was this deterrence? In the above chart we see the actual number of rockets launched (and not merely attacks which often include multiple rockets) at Israel from 2005 until the end of 2013 from the Gaza Strip. Again, a sharp increase follows the 2005 Disengagement until a sharp drop caused by Operation Cast Lead in 2009, with a low that had not been experienced since before the Disengagement in 2010 at “only” 152 rockets launched at Israel. As Hamas re-armed and regrouped, the increase came sharper, faster and with longer range missiles, with an all-time high in 2012. This led to Operation Pillar of Defense, under Benjamin Netanyahu, which ultimately was a solely aerial campaign attempting to bomb Hamas into submission. Again, the deterrence worked for a short term, with an even lower count of only 63 rockets launched in 2013, compared to the 152 launched the year after Operation Cast Lead (though admittedly, Cast Lead occurred at the beginning of 2009, and Pillar of Defense, at the end of 2012). Of course, the graph stops at 2013, when in fact the very next and current year, 2014 had seen 450 rocket attacks (not individual rockets which would be a higher number) before the beginning of Operation Protective Edge. During the first 29 days of operation Protective Edge, a whopping 3,356 rockets were fired at Israel, and as of writing this article they are ongoing and mounting. Not nearly the end of 2014, it is already by far a record high for both the number of rockets launched at Israel from Gaza, and their range and payloads; this after more than a decade of Israeli leaders promising that no such rocket fire will be tolerated. The pattern is clear, the IDF’s operations are undoubtedly painful for Hamas, who curtails its activity by choice or necessity for some time thereafter, but falling short of victory each time, the Hamas rebound is not only fast, but stronger and even faster each time. The underlying reason remains that there are no negative long term consequences for these attacks, not for the Gazan population as a whole, not for Hamas, and not for its sponsors that allow its rearmament. Today, Qatar and Turkey largely taking the place of Iran and Syria in this sphere due to the world-wide Sunni-Shiite conflicts ranging. Ultimately, Hamas and the Gaza population are Sunnis, while Iran is staunchly Shiite. Having discussed the rocket fire being launched at Israel, which without both the Iron Dome system and Israeli artillery and Air-force fire hitting Hamas launch zones after attacks, would have caused hundreds if not thousands more civilian casualties, it is the frequent air campaigns that Israel has employed as its main countermeasure that need to be examined. This is a difficult topic to discuss, because it includes criticism of Israel, not only in the strategic sense, but also in other areas where many assume Israel holds the high ground. Previously in this article, as well as in several others, sharp criticism was levied at Israel’s (and the pro Israel camp’s in general) use of Public Relations resources. What in the current round of conflict, I have described as the “Hamas is really mean!” political campaign. Parallel to this ineffective PR method, Israel and Jews in general have reflexively lunged out at anyone who has criticized the Israeli air bombardment of Gaza and its relatively high civilian death toll. The claim is quickly dismissed as either a lie, or blamed on Hamas for their use of human shields, and anyone who challenges this is quickly attacked as an anti-Semite. This is not only misleading at best, but once again of no benefit to Israel or her interests. Let’s take a look at the facts of the bombardment a bit more objectively. True, claims that Israel is intentionally killing as many Gazans as possible in this or previous rounds of fighting are absurd. Even accepting the exaggerated Hamas’ claims of civilian casualties at face value, the result is less than .07% of the population. The real number of truly civilian casualties, significantly lower. Certainly if Israel was trying to kill as many Gazans as possible, with complete air superiority, vast advanced munitions of all types in the form of artillery and air-to-ground bombs and missiles, and a target population largely concentrated in 3 dense urban centers (Rafah, Khan Younis and Gaza city) living in unprotected buildings, the death rate would be many orders of magnitude higher indeed. In fact, it is easy to imagine that few if any Gazans could escape an Israeli attempt at killing as many people as possible; ironically it would be mainly Hamas members with access to bunkers and tunnels. Some people who at first leveled such accusations at Israel, after a careful look at the facts have changed their opinion. Most notably among them is Richard Goldstone, head of a UN fact-finding mission in 2009 after Operation Cast Lead, who in 2011 stated that he no longer believed Israel intentionally target civilians after opposite claims were made in the initial Goldstone Report. Note that this assertion by Goldstone did not only refute the claim that Israel was killing as many civilians a possible, which is absurd, but that it was killing any civilians at all intentionally as matter of policy. Still, the opposite claim that all civilian casualties are “mistakes” and Israel is doing everything in its power to limit those casualties is also misleading. Israel is not carpet bombing Gaza, it is using precision guided missiles that it can deliver to a specific window in any given apartment. A few days before the 29th and perhaps final day of Operation Protective Edge, the total death toll in Gaza stood at somewhere above 1000 people, and possibly as high as 1,600. While the a UN body issued a statement that 87% of those deaths were of civilians, the Israeli counterclaim was that in fact only 47% were civilians. I would not be surprised if the truth lay somewhere in the middle, the difficulty largely coming from what constitutes a “civilian” since Hamas fighters are not uniformed (except for when they wear IDF uniforms in another Geneva violation), and ironically the casualties that actually ARE uniformed, members of the police forces, the UN considers civilians while Israel reasonably states that as armed members of the Hamas regime apparatus, they are enemy fighters. There has been many reports about Hamas police taking part in terror attacks against Israel, in fighting against the IDF, and about the large overlap and fluidity between the Hamas Executive force, the al-din brigades and the Police. But in either case, Israel’s own assertion of 47% civilian casualties is definitely high enough. Certainly high enough to not warrant the pro-Israeli dismissal of any questions or criticisms on the subject. War is a dirty business and some collateral damage as parts of true “mistakes” is part of it, but this implies that in killing hundreds of enemies, some civilians are killed, and not that the majority of the casualties themselves are civilians. This turns the Hamas fighters into the “collateral damage” rather than viceversa. It is true that as a broad general policy, Hamas fighters hide among the population, un-uniformed; which if they did not do, would cause them to simply not exist very long to fight. But Israeli claims of their use of human shields is often exaggerated. They do not on the whole, run out with Ak-47s in one hand and babies in the other as some of the stories that have circulated claim, or revel in the deaths of their countrymen. Their actions are meant more to prevent strikes than to hope strikes kill civilians. For example, the hamas fighter quoted earlier escaping in an ambulance is not hoping that he and the ambulance get blown up in order to score international PR points, rather he is relying on Israel’s norms of moral behavior and hoping to survive. The same is true for Hamas’ leaders hanging out at the al-Shifa Hospital. The intent here again, is not to cause hundreds or thousands of civilian casualties, but rather to save their own lives. So with this in mind, the Israeli air strikes killing civilians are not so much a mistake, as they are a decision. Israel will not strike the ambulance, it will not strike the al-Shifa Hospital, but it will strike a home or small apartment building housing Hamas cache of weapons. Often it will try to minimize the casualties by warning people to get out, and if there are hundreds of people who flock to the home as was often case during this conflict, Israel will decide not to strike it. But it if it estimates that it may kill 1 or 2 civilians at most, then it will decide to strike. The truth is closer to the above scenario, the civilian casualties are not mistakes per se, but decisions. Israel does not want to kill civilians, but it also does not want to give Hamas fighters immunity, which it cannot do in war, and there is also a sense of a continuum of collective responsibility. The Hamas government was voted by a majority of the Gazan population. The population continues to tolerate Hamas or support it, in that it has not overthrown it, neither by vote nor force. So Israel figures Gazans as a whole have some degree of responsibility. How much more so do nominal civilians who allow Hamas to store weapons in their home or fire from their home? And Israel’s government has been betting that if consequences like these make you think twice about allowing Hamas fighters or weapons in your midst, all the better; though as has been discussed previously in the article, this does not work. Israel has indicated it bombed thousands of targets in Gaza during the latest conflict, just like it has indicated in previous rounds of the Gaza conflict. It wasn’t rare for the IDF to announce it had targeted 1000 targets in a single day. This shows that the civilian death toll per strike was very much lower than 1; perhaps more like .05 civilian killed per strike. So certainly, in the individual strikes Israel did more than what is reasonable to avoid civilian casualties, but as an overall decision of launching an air campaign of thousands and thousands of airstrikes in Gaza, it is almost by definition making a decisions that hundreds of civilians will be killed. 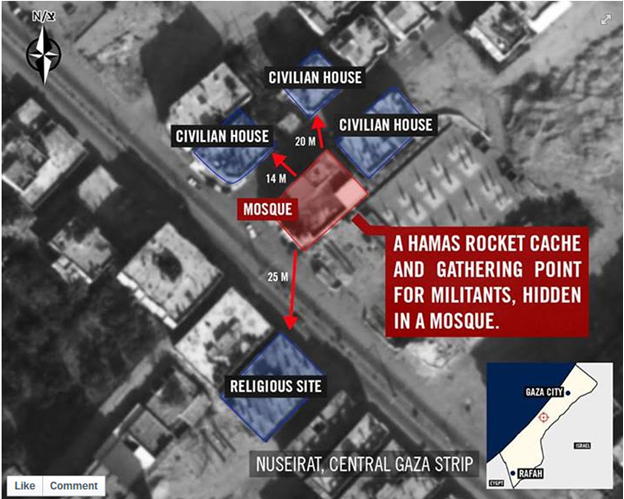 Numbers Hamas could only hope would be killed by their civilian-targeting rocket attacks. During the Clinton led NATO 1995 bombing of Yugoslavia, NATO air forces killed at least 2,000 civilians according to very conservative estimates. These include at least 88 cases of children killed. Estimates vary widely in the civilian deaths in the subsequent Kosovo bombings, and they are in the thousands. Incredibly, 200,000 ethnic Serbs had to leave their homes and became refugees as NATO backed the Muslim takeover of their homes. Though the media largely portrayed the conflict as a sudden Serbian invasion of Kosovo, Serbs had lived in Kosovo for hundreds of years and the Serb and Albanian (the so called Albanians in Kosovo were largely ethnic Serbs that had converted to Islam during Ottoman occupation of the area) majority areas were roughly divided equally. But all of that is the subject for another article. Sufficed to say the outrage and protests were largely unseen and unheard. The recent NATO air campaign against Qadaffi’s forces in Libya, also did their fare share of killing. NATO itself admitted to killing 65 civilians, and wounding 55. The Qadafi government claimed significantly higher figures. In one incident alone, 3 journalists were killed, and in a gathering in Tripoli for morning prayers, at 11 religious leaders were killed among 50 other casualties. The Report by Human Rights Watch, “Unacknowledged Deaths”, details eight specific incidents where at least 72 Libyan civilians died as the result of NATO’s bombing campaign. A third of the victims were children under the age of 18. Ironically, the reports does stress that NATO tries to minimize civilian casualties, and that the Qadaffi government “did play up and, on occasion, stage incidents of collateral damage as last-gasp propaganda for their flagging war effort”. Actions which Human Rights Watch has little problem attributing to NATO and the ex-Qadaffi regime respectively, but not to Israel and Hamas. I venture that success (Qadaffi is gone) plays a major role in this. Be that as it may, the civilian casualties in this campaign, though significant, were relatively lower, and the overall campaign a NATO success. Note that it was in essence a ground campaign with air cover as opposed as an attempt to bomb Libya into submission. Yes, the boots on the ground were not NATO troops (with special forces exceptions), but Libyan themselves, who were about to be overrun by Qadaffi forces until this air cover materialized which turned the tide (we covered that war extensively here). Something to keep in mind to be discussed shortly. The Clinton 1998 short bombing campaign over Iraq, Operation Desert Fox, killed dozens if not hundreds of civilians and did previous little to the Saddam Regime or his capabilities. If we had known that was all you would do, we would have ended the inspections long ago. During the US’ Panama invasion, CODEHUCA estimated 2,500 o 3000 civilian deaths. reveal that the “surgical operation” by American forces inflicted a toll in civilian lives that was at least four-and-a-half times higher than military casualties in the enemy, and twelve or thirteen times higher than the casualties suffered by U.S. troops. By themselves, these ratios suggest that the rule of proportionality and the duty to minimize harm to civilians, where doing so would not compromise a legitimate military objective, were not faithfully observed by the invading U.S. forces. An independent report led by Attorney General Ramsey Clark claimed more than 4,000 civilian deaths, and that about 15,000 civilians were made homeless by the invasion. Take the 1991 Gulf War (not the 2003 invasion of Iraq), which was very unpopular BEFORE it started (everyone, specifically the Democrats predicted another Vietnam), and extremely popular AFTER its success (though the Democrats then switched from having opposed the war entirely, to criticism of President Bush (senior) as he had not deposed Saddam entirely. In one incident alone, a bunker in Amiryah was bombed by the US air force, killing 408 civilians who were sheltering there. The air campaign caused about 3,500 civilian deaths, in addition to the 10,000 to 20,000 military casualties, numbers approximately agreeable to several independent reports, and ultimately many more thousands of civilians in after-effects – one report by Beth Osborne Daponte claiming one hundred thousand. But of course we don’t have to go far back at for truly high civilian casualties at the hands of Western armies. The Iraq War and Afghanistan quite suffice. Iraq Body count estimates 7,500 civilians killed in Iraq during the initial invasion phase. Total civilian deaths during the long conflict after that are of course highly disputed, but truly massive by anyone’s count. From 2003 until 20011 for example, a host of reports put the civilian death toll by violent deaths, at anywhere from 133,000 to over a million. Of course, these are not all deaths caused directly by coalition forces, but the total of all those caused by any of the factions fighting each other within Iraq; however it is largely understood that they are at least a direct effect of the invasions, as previous to it, despite sanctions, No-Fly Zones and occasional air strikes against Iraq, it was internally quite stable. For example, Iraq Body count reports that from 2003 to 2013, it has reported over 15,000 civilian casualties caused by coalition forces (13% of the total), and about 29% of this figure, is composed of children. The number of people made refugees in the conflict is in the millions. Over 20,000 civilians have been killed in Afghanistan since the beginning of the 2001 war. The Nation estimates that from 2001-2012, 6,481 of these were at the hands of coalition forces, the vast majority (5,622) by air strikes. If one starts going a bit further back, Vietnam, Korea, WWII then obviously we find US and Western led air campaigns of massive proportions that killed untold numbers of civilians. One need only think of two atomic bombs dropped on Japanese civilian cities during WWII or the infamous fire bombing and devastation of both Europe and Japan. So, surely the massive outcry of Western leaders, governments and organizations at Israel’s campaign against a terror organization launching thousands of rockets at its heartland are tainted with plenty of hypocrisy. Certainly, neither Panama, Iraq, Serbia or Libya were launching missiles at the US, and look what the US and European combined armed forces did to them. Even in Afghanistan, it was not the Taliban who attacked the US even in the event of the single though deadly 911 terror attacks; Afghanistan’s Taliban government merely refused to hand over Al-Qeada members wanted by the US for these attacks. In Israel’s case, a Gaza government is not harboring a few Hamas terrorists, but rather Hamas itself rules Gaza. In any case, just like Western forces have decimated parties that were engaged in warfare against other internal parties, and in turn killed plenty of civilians themselves, in plenty of other cases they have ignored similar situations. Most recently on the headlines, is the vast civilian death toll in Syria, or even more so the slaughter of civilians by the Western supported jihadists such as the ISIS that were fighting the Syrian regime and have now expanded to look to much broader horizons. Air Campaigns cause exponentially higher civilian casualties than ground operations (when both mean to limit them). Wars cannot be won from the Air Alone – at least not yet. Air campaigns as ground support and in conjunction with ground operations are very effective. The first conclusion indicates that paradoxically, when Israel tries to limit casualties on both sides by using only air power rather a decisive ground operation, it does the opposite. Though Hamas casualties may indeed be lower, Arab civilian casualties are dramatically higher. Secondly, because during the operation massed large number of troops on the Gaza border areas, without giving them freedom to defeat Hamas decisively or advance deeper into Gaza, relatively large numbers of casualties weer suffered by the IDF as well. In a “worse of both worlds” scenario, the IDF presents its troops as targets for Hamas by massing them at Gaza, but then opted for largely an air war which neither defeats Hamas nor limits Arab civilian casualties. Take note that all the recent “victories” required troops on the ground. The Libyan campaign, which had a relatively small amount of civilian casualties was really a close ground air support mission, since the “boots” on the ground were the opposition forces. Qadaffi was not bombed into submission, rather he was defeated by internal enemies that were supported by NATO air power. The same is true with the successful initial phases of the Iraq and Afghanistan wars. In the case of Iraq, coalition forces actually invaded Iraq, and in the case of Afghanistan, similarly to Libya, the local “Northern Alliance” took control of Afghanistan with US Air support. Likewise, air strikes over Taliban controlled areas in Afghanistan, jihadist areas in Yemen, and the Tribal Regions (such Waziristan) in Pakistan prove ineffective other than in inflicting casualties, civilian and combatant alike. Israel’s own experience over Lebanon and Gaza prove to be no different. The one example which wrongly convinced many in the world that air power alone can finally, due to technological advances, win a war was the campaigns over the former Yugoslavia in the 90s, which effectively brought Slobodan Milosevic to the negotiating table. The intelligent and respected military historian John Keegan, himself alluded this new phenomena himself. However, this example has been misinterpreted. Firstly, it is one thing to conduct air strikes against a country, whose government than might chose to come to the negotiating table to end them. This is somewhat similar t sanctions and other punitive actions. It is quite another thing to decisively defeat a motivated and stubborn enemy by such air strikes alone. Milosevic remained in power, it is he chose to negotiate; the air strikes did not topple his regime nor themselves cause him to lose control of the territories he ruled. Secondly, even these concessions by the Serbian government were not entirely due to the air strikes alone. The officer in charge of the operation itself, thinks otherwise. Before Slobodan conceded, the criticism was growing rapidly against the NATO air campaign which was proving ineffective, while costly in civilian casualties. In frustration at its ineffectiveness, NATO was moving forward with plans of a ground invasion. The troops, logistics and authoritarians for it were in place, and it is the imminent threat of the ground incursion that forced the Serbian government to back down. The concession was made after a highly publicized session between Bill Clinton and the Joint Chiefs about the ground invasion. The picture would be much different with known guaranteed immunity against a ground operation, and the knowledge that the Serbs need only outlast the air campaign. So while Air capabilities have increased, so have defensive technologies (bunkers, tunnels), and as has the sensitivity to civilian casualties with the 24 hour news cycle and instant video and image feeds directly broadcast to millions worldwide. So as Israel should have learned from these lessons if not the several previous rounds of fighting in Gaza or the 2006 Second Lebanon War, that the air force alone can not only not win a war, but not even force Israel’s asymmetrically armed enemies (ie Hamas, Hizbollah) to stop launching rockets. It also cannot effectively deal with underground infrastructure, like the infamous Hezbollah “nature reserves” and these Gaza tunnels. So for the reasons discussed, it is obviously folly to go about war with mediocrity and “half assed”. The lives of the people involved are not toys for spineless politicians; and any such venture should be taken only when necessary, with the deepest and most responsible of thoughtful reflection, and then be launched only while fully committed to victory. Clear objectives and an exit strategy are a necessity. So what does this “victory” look like you ask? In previous articles I have written about the importance of consequence… that there must be political and territorial consequences for Israel’s enemies for there to be any deterrence in the future. The economic boom which bombing buildings in Gaza will not do. On the other hand, as was discussed in my 2012 article, Netanyahu is reluctant, as he proved to be then, to topple Hamas. There are strategic reasons why this would be detrimental to Israeli interests, and certainly Israel should not want to put it under PA control, on the contrary, the West Bank – Gaza split is vital. The concerns about ISIS or other jhadist groups taking over instead of Hamas are symbolic, there will not be any demographically significant changes in Gaza in the short term, and any such change would be only a change in name only. It hardly makes a difference. Though the media makes ISIS look like Mongolian hordes capturing territory seemingly out of nowhere, it is more accurate to realize they are simply Sunni jihadists overthrowing non-sunni governments where they already represent a majority. This is why ISIS has not been able to take southern Shiite Iraq, or even Kurdish regions, or even the Alawite Syrian regime, but wherever there are sunni majorities already, it has done quite well (in no small measure thanks to the Obama administration’s support as well as that of Qatar). In the case of Gaza, these “hordes” even if they existed, have no way to enter in any significant number, so any ISIS rule of Gaza would be nothing but a name change, by the people already there (who in fact are virtually all Sunni Muslims). So as I wrote several times previously, the re-establishment f Gush Katif would be quite a great start, especially given the strip’s true history, but noticing that this lies in a political dream world in relation to the current government’s position, here let us outline a most modest and simple plan. First and foremost, as hopefully is clear by now, there must be a victory. Clear cut and plain for all to see. The war must not be a war against tunnels, nor terror nor any against any other euphemism nor military tactic that our enemies use, but rather against the enemy itself. Hamas must be dealt a crushing blow, and certainly toppled from the ruling regime in the Gaza strip. Many today reflexively question if that is possible. Amateur military theorists abound with ideas about guerrilla warfare and asymmetric warfare, usually with the perception that they can never be defeated by a traditional modern army. Others suffering from a Vietnam complex, will swear that such operation would cost the IDF thousands of casualties. A little perspective, as usual, would be helpful here. The IDF in Gaza faces no resistance in the form of a “front line”, a lesson Hamas learned during Cast Lead. Though on paper, their numbers should allow meaningful resistance, Hamas fighters tend to melt away as the Merkavas charge forward. It must be made clear, that nothing stops the IDF from moving forward in Gaza, other than the army’s orders, handed down from the political echelon. Hamas’ tactics are not to be dismissed, from ambushes to IEDs, they take their toll and have proven effective to a degree, Gaza is a dangerous place indeed during an invasion, but nothing there remotely approaches a military roadblock against the IDF. If we are to consider a reasonable, modest and positive future plan, the past of the strip must be taken into account. What is the Gaza Strip to begin with? It must be noted that it is not an entity with any deep geographic, cultural or political past as an entity itself. Two main urban centers exist in the Strip, Khan Younis and Gaza city, which the strip has been named after. At its southern end is Rafiah along the Egyptian border. Historically, what is today the Gaza strip has been continuously linked to the rest of Judea and the land of Israel. King Saul and King David fought the European (Aryan or Indo-European) ¨Sea Peoples¨ in the area that invaded the coastal areas of Near Eastern kingdoms long before classical antiquity. The Bible immortalizing them as Philistines (a people of absolute no relation to the Arabic speaking Muslim population often termed palestinian today). The strip continued to be ruled by the Jewish Kingdom, including the Hasmonean Kingdom after the famous Maccabee Revolt. It is specifically referenced in the Book of Judges by Joshua as part Eretz Israel. The strip usually was ruled by whichever power ruled the rest of Judea and/or Israel. It was often under jurisdiction of eastern empires such as the Assyrians and Persians, or Egyptian ones such as under the Ptolemies. Ancient Jewish sites including synagogues are found throughout the strip, including the Jewish Quarter of Gaza city. Gaza city itself has had an uninterrupted Jewish presence from the time Jews first roamed Judea until 1929 when Arab riots murdered and chased out the remaining Jews. A 16th century Ottoman Census, has the majority of the inhabitants in Gaza City as Jews. Ottoman censuses of the 16th century show a thriving Jewish community. It also had a very significant Christian community until the Islamic conquest which turned most of the churches into Mosques and forcefully virtually eliminated the Christian community by the start of the modern period. Even after 1929, Jewish presence quickly resumed. For example, Kfar Darom was purchased by Tuvia Miller the following year (1930); 250 dunams (~62 acres) and named after a Talmudic era Jewish town by the same name in the area. A kibbutz was established in Kfar Darom, and in 1948, after fierce resistance, the village was abandoned and overrun by the Egyptian army. The Gaza strip, was subsequently “Jew Free” only during the 19 years between 1948 and its liberation in the 1967 Six Day War – Nineteen years out of the millenia of continuous Jewish prescence, a prescence far predating any known historical reference to Arabs at all anywhere, and certainly the establishment of Islam by Muhammed starting in 610 CE. So ultimately, the Gaza Strip is simply a part of Israel, originally not separated ethnically, culturally or geographically in any way from the rest of it. The population of Gaza was quite sparse at the outset of the 1948 Israel independence war, and many of the Muslim or Arab clans in the region were recent arrivals, both from Egypt and Turkey. Yasser Arafat himself, the ultimate symbol of “palestinian” nationhood was himself born in Cairo, an Egyptian citizen. So where did its recognition as an entity come from? Quite simple… The Gaza strip is the strip of land the Egyptian army was able to conquer during the 1948 war, and it ends, where Israel was able to stop the Egyptian armored columns. Had they not stopped them where they did, the “Gaza strip” would be longer and larger, the column was headed for Tel-Aviv up the coastal road. To be more precise, the Egyptian army had gotten even further, up to today’s Ashdod (an undisputed part of Israel today). The previously mentioned Kfar Darom stopped the Egyptian onslaught (often with no more than a couple of dozen defenders against both regular Egyptian army troops and Muslim Brotherhood units) from December 7 1947 to July 9th 1948 when Kfar Darom was evacuated by the IDF. Subsequently, the Egyptians pushed further up the coastal road, to be driven back near the end of the war to roughly today’s Gaza northern border. The specifics, as usual are a bit more involved. It is actually world and United Kingdom political and military pressure which established this strip. Initially, the Egyptian army had conquered large swaths of Israel, including much of the Negev desert. Once the nascent IDF has been able to stabilize the situation in the other fronts (the Syrian, Lebanese and Jordanian borders), in operations such as operation Yoav and Horev, Israel, in the final stages of the war was able to push the Egyptian army out of the Negev including its desert capital of Beer Sheba. The indomitable Yigal Alon led the operations, and was able to surround what was left of the Egyptian army in the Falujjah pocket and in the Gaza strip by conquering Rafah. Both armies were cutoff and would have been forced to surrender, the territory they held including the entire Gaza strip falling to Israel once again, indistinguishable from other territory Israel gained or recovered in the same war. World pressure was applied against Israel to let the Egyptians go, and Westminster threatened to invoke the 1936 Anglo-Egyptian Treaty of Friendship, in essence openly going to war against Israel together with the Arab regular and irregular forces invading Israel from all sides; this when the UK had governed the mandate which was supposed to transform into a Jewish state. The IDF downed five Royal Air Force spitfires, taking 1 pilot prisoner. Israel had also launched raids into the Nitzana area, and entered the Sinai Peninsula in late December. Umm Katef and Abu Ageila were captured (made famous by their recapture for the third time by Israeli forces under Sharon during the Six Day War), and the IDF was en route to El-Arish deep in the Sinai. The Britts moved troops to Aqaba, and threatened war. Against the IDF protests, Ben Gurion forced the IDF to step back and accepted a ceasefire. The surrounded troops in the Faluja pocket went home, and Israel kept the region, but in Gaza, when the IDF encirclement was lifted, the continuity with Egyptian held territory meant that the Gaza Strip was now in Egyptian hands. Gaza as an entity exists, thanks only to British military threat against Israel. the inequitable and unfair rules of engagement: the Arabs could launch offensives with impunity, but international interventions always hampered and restrained Israel’s counterattacks. Here not much has changed except the ever diminishing Israeli “Chutzpah” to defy these pressures. Subsequent to the Independence War, the number of Muslims in the Gaza strip swelled as it absorbed refugees from other areas. Despite Egyptian control, Egypt refused the Arabs in Gaza (many of them had been Egyptian to begin with) freedom of travel into the rest of Sinai and Egypt, thus starting the trend of crowded conditions seen in Gaza today. Egypt festered the cramped population as proxy weapons against Israel, and soon Fedayeen terrorists were staging attacks across the border into Israel. Jordan, who in similar fashion had ended up with the West Bank after the war, held by the formidable British-led Arab legion, annexed the territory and gave Jordanian citizenship to all those who did not already have it, after of course ethnically cleansing the territory of Jews who either fled or were massacred. The country, now occupying both banks of the river, was renamed “Trans-Jordan”. For all practical purposes it would be true to say that for the last six years in Gaza over 300,000 poverty stricken people have been physically confined to an area the size of a large city park. Once Egypt established control of the strip, again declaring its indistinguishable nature from the rest of Israel, it established the “All-Palestine Government” which claimed jurisdiction over all of Israel including today’s West Bank, with Jerusalem as its capital. Before Israel closed off the Egyptian forces within the strip late in the war as described previously, the symbolic government fled to Cairo. Nominally, it was independent and reported to the Arab League, whose member all recognized it as the Arab government of all Eretz Israel and not merely Gaza (except Jordan who did not recognize it as the government’s claims conflicted with its own claim over the West Bank’s land and population), though nominally it had de facto jurisdiction only in the Gaza Strip. In reality, it held no real power at all as Egypt had military control over the strip, and physical, economic and political control over the symbolic government which sat in Cairo. The Arab League members supported the All-Palestine Government as a way to save some face for having lost the independence war against Israel, and returning their armies home. They also supported it as a bulwark against the Hashemites of Jordan and his interests in the region. After Nasser nationalized (a nice way of saying “stole”) the Suez Canal, Israel launched the 1956 Sinai Campaign, in concert with the UK and France who wanted to punish Nasser for his policies. Moshe Dayan, Israel’s infamous army chief of staff at the time, ordered the capture of the Gaza Strip as part of operation Kadesh (whose main objective was the Egyptian army in Sinai), as Gaza has become a hotbed of terrorist activity into Israel since 1948 (the infamous Fedayeen) and was a strategic launchpad for the Egyptian army into Israel’s heartland in case of war. The plan was to first take Rafah and secure the northern road across Sinai through Al-Arish while cutting off the Egyptian forces inside the strip. Dayan figured much of the Egyptian force would collapse once cut off. Rafah was defended by the Egyptian 5th infantry brigade commanded by Brigadier General Jaafar al-Abd, and the 87th Palestinian infantry brigade. The combined forces together held a series of forts outside of Rafah city. The IDF attacked with the 1st infantry brigade under General Benjamin Givli and the 27th armored brigade under the future chief of staff Haim Bar-Lev. After the first night of fighting, Jaafar ordered his troops to fall back within the city. The 27th armor brigade took off westward after fleeing Egyptian forces towards El-Arish which was taken by the following day. Later on Nov 1, the Arab general, hearing the panicking Egyptian Field Marshal Hakim Amer’s order to fall back towards the Suez canal, led his troops through gaps in the Israeli lines and fled into Sinai. Three hours later the IDF held Rafah. The entire “massacre” in the taking of Rafah claimed by the Arabs which was disputed by Israel at the time, was of 111 people. In the northern strip, IDF infantry and armor attacked fortifications outside of Gaza city late the same day (Nov 1). The al-Muntar fortress guarding Gaza city was taken by the IDF forces, who killed or captured 3,500 Egyptian NAtional Guard troops there. After breaking the enemy lines, the IDF tanks raced straight into Gaza city. And “tanks” should be understood in context, these were not the Merkava tanks of today, nor even the old Pattons, but WWII leftovers. By the next day on Nov 2, there was no more resistance in Gaza city or its surroundings. On Nov 3rd, the IDF which was wholly focused on a large full scale war against Egypt across the Sinai Peninsula, attacked the remaining central sector of the strip dominated by Khan Younis. Khan Younis was heavily fortified and defended by the 86th Palestinian Brigade. Israel’s 37th armored brigade broke through these lines, and advanced into the city. There was heavy street fighting against Egyptian troops and Fedayeen forces in the city. By noon Nov 3rd, virtually the entire Gaza Strip was in Israeli hands. The UN received reports, though which are often exaggerated, that “dozens, perhaps hundreds, of non-combatants killed in the street fighting”. As is typical, all non-uniformed combatants which included all the Fedayeen and many of the Egyptian troops were counted as non-combatants. But even if the full numbers claimed by the Arabs are accepted, the civilian casualties of the conquest of the entire Gaza strip, heavily fortified not only by the local population and terrorist organizations but also by a heavy presence of the Egyptian military, are remarkably small. When one considers that many if not the vast majority of those were actually enemy combatants, then the statistic is truly astounding. But the reason is not. Israel’s leaders sent in the IDF to capture the territory and defeat any enemy who resists, instead of bombing the strip flat in a senseless air campaign. IDF soldiers on the ground know what they are shooting at, and they do not shoot at old ladies and children, but rather at enemies. With the firepower and confusion of modern war, mistakes are still made, but nothing of the scale of an air campaign. The UK and France, themselves under US pressure turned against Israel after the Operation and massive pressure and military threats from both world superpowers of the time, made Israel retreat not only from the Sinai Peninsula and the Suez canal which it had reached, but from the entire Gaza strip as well. In October 1965 Eisenhower told Jewish fundraiser and Republican party supporter Max M. Fisher that he greatly regretted forcing Israel to withdraw from the Sinai peninsula at the time; Vice-President Nixon recalled that Eisenhower expressed the same view to him on several occasions. Still at the time, Eisenhower left Israel no choice but retreat. As was to become the rule rather than the exception, Arab aggression carries no territorial consequences, because though Israel can win wars with blood and treasure, it must always give back any gains. This fact more than any other continues to fuel the conflict. Back in Egyptian hands, Nasser finally abolished the symbolic All-Palestine Government in 1959 and placed the strip under formal military Egyptian control. This meant little on the ground, but it was a sharp formal difference. Egypt and Syria united under the United Arab Republic; a result of the pan-arabism that was popular at the time and Nasser fiercely espoused. This too of course was largely a formality, and never really a reality. As part of this pan-Arab policy, there was no need for a different Arab regime in Israel so Nasser finally formally admitted direct control of the strip (though he continued to restrict its residents access to the rest of Egypt, free trade, and continued to keep large sections of the population in refugee camps). Once the PLO was established in 1964, with several Arab countries hosting and supporting their own factions, Nasser paid some lip service to granting it some jurisdiction in the strip but he never did anything of the sort. Each PLO faction was used by its host country as a proxy and weapon against its enemies, which allowed it to nominally keep arm’s length from the frey. This Arab tactic is alive and well today. Syria, Iran, Qatar and Egypt among them, continue to play this game though Hezbollah, Hamas, PFLP, PLA, and various other terror groups. The West keeps falling for this tactic (when would Qatar ever be bombed for funding terror across the world?.. not likely) and so it continues to be a good tactic. Egypt did institute conscription for the PLA (Palestinian Liberation Army), although PLA units were simply attached to the regular Egyptian military, as was the case with PLA units in other Arab host countries. The bulk of the PLA was finally destroyed by Israel during its 1982 invasion into Lebanon, where the remnants of the PLO were expelled to Tripoli in north Africa, forgotten and not to return until a leftist Israeli government invited them back not to Egypt, Jordan, Syria or Lebanon, where they had been before, but within Israel proper. This begins the Oslo era and all the tragedies that come with it, haunting us till today. The direct Egyptian control of the strip lasted until 1967 and the Six Day War. At the outbreak of the war, Moshe Dayan, now Minister of Defense, had ordered that the IDF avoid the Gaza strip and its urban population centers completely. Again, he believed that the Egyptian formations within the strip would collapse if cutoff from Sinai. So once again, Rafah and the southern strip was the target. The advance was led by the legendary 7th Armored Brigade (later to be commanded by Avigdor Kahalani) under Colonel Shmuel Gonen, itself part of a division led by General Tal. The plan was for the 7th to outflank Khan Younis from the north, avoiding the urban areas, while the 60th armored brigade under Colonel Menachem Aviram would advance from the south and link up and surround Khan Younis. Meanwhile, the paratroopers under the legendary (and missed) Raful would take Rafah itself. Gonen entrusted the breakthrough to one battalion under Elad. At first resistance was light but in the fierce fighting that followed, Elad, Pinko and Ori Orr were instrumental in seizing Southern Gaza, and allowing for the subsequent capture of Sinai. Rafah and Khan Younis were taken the first day, and Tal’s division was racing westward into Sinai. About two thousand Egyptian soldiers were killed during the battles around southern Gaza. North of Khan Younis, the IDF had meant to not engage the enemy, but Fedayeen and the 20th PLA infantry brigade opened fire on Negev Settlements including on Nirim and Kisufim. Back then, Israel did not require years of shelling to respond, that one day was sufficient. The 11th mechanized brigade under Colonel Yehuda Reshef was sent into northern Gaza, and encountered stiff resistance. By the end of the first day, southern Gaza was in Israeli hands, and the Israelis had taken the Al-Muntar ridge yet again, but were beaten back from Gaza city itself. On the second day, the northern sector was bolstered by Raful’s paratroopers and in fierce fighting took Gaza city and the rest of the strip. Seventy troops were killed in the first days’ battles over the fortifications guarding Gaza city, and there was 12 UNEF members killed and two journalists, Israeli Ben Oysermanand and American Paul Schutzer. Overall, the casualties the IDF taking the strip were nearly half of all teh casualties suffered in the southern front in a campaign that saw Israel defeat 7 Egyptian divisions, the Egyptian Air-force, Navy, and seize all of Sinai to end up on the Suez canal yet again. In Israeli terms, these were considered high, though in relation to enemy losses, the objectives achieved and the nature of the missions, they are remarkably low. Once again, the IDF had taken the Gaza strip in less than two full days of fighting. For those who may point out that circumstances were much easier for the IDF back then, the reality may be the opposite. Sure, the population of Gaza was a bit smaller, and so was Israel’s (the recruiting base for its army), and today Hamas counts with a few more advanced weapons in terms of anti-tank weapons and long range rockets, but it is a negligible difference compared to the advancement in IDF weaponry of all kinds, from battle tanks to guided missiles and drones. Most importantly, Gaza had Fedayeen and terrorist groups fighting Israel at every conflict much as today, but during the Six Day War, there was two reinforced Egyptian Divisions heavily fortified within the strip and 4 full Egyptian Divisions near the Gaza area. Major General al ‘abd al-‘Aziz Suleiman led the Egyptian 7th division, guarding southern and central Gaza. Suleiman was Commander of the Egyptian Infantry’s school, and he led a fierce resistance against the IDF. Only when he himself was killed, did his division finally rout. Further north, the Egyptian 20th division (A PLA unit) was led by General Muhammed ‘abd al-Mun’imHusni, Gaza’s military governor. The General ultimately surrendered his forces and the strip to the IDF during the war’s second day. A single paratrooper’s brigade had taken large parts of the strip including the most fortified and urban areas. A few other battalions, together forming about a second brigade’s strength, including Ori Orr’s recon company, had done the rest. This was all out ground fighting with virtually no air support, as the IAF was focused on the Sinai and Egypt proper. After the Six Day War, Israel established military rule over the population, and general conditions including economic freedom greatly improved. In 1968 the PLO established its Yarmouk brigade under the PLA to conduct terrorist attacks against Israel from the strip and resistance against the IDF within it. It has been shown that the IDF has time and again, seized what is the Gaza strip in a mere couple of days. It has been shown that always withdrawing, Israel has invited further bouts of conflict. It has been shown that aerial campaigns alone do not work with current technology, as they simply kill large number of civilians and cannot defeat a determined enemy. It has also been shown that Israel has as much right to the strip’s territory as anyone else, and its current regime holds it by breaching every agreement that Israel has agreed to in exchange for territorial withdrawals. As air support for ground campaigns, Air campaigns are extremely effective. What has happened to Israel, how can some mere thugs in the shape of Hamas, without any direct military support as existed in previous wars, have the country contorting itself in desperate ill-conceived moves? In its desperation Israel blames and angrily attacks bias media across the globe, but in reality is Israel’s government that has been unable to deal with the small threat of Hamas terrorists launching homemade rockets at Israeli cities. Israel has conducted an Air campaign that has galvanized world opinion against it, has failed to damage Hamas in any permanent way, flattened much of Gaza (which as explained above leads to a subsequent economic boom for Israel’s enemies), and launched a half baked weeks long ground operation waged against tunnels rather than Hamas and unnecessarily put the IDF’s young men and reservists at risk. Israel reserves its inherent right of self defense, both preventive and reactive, including where necessary the use of force, in respect of threats emanating from the Gaza. …Israel will continue to maintain a military presence along the border between the Gaza Strip and Egypt (Philadelphi route). This presence is an essential security requirement. At certain locations security considerations may require some widening of the area in which the military activity is conducted. Subsequently, the evacuation of this area will be considered. Evacuation of the area will be dependent, inter alia, on the security situation and the extent of cooperation with Egypt in establishing a reliable alternative arrangement. The Disengagement was a horrid wretched and likely treasonous surrender and desperate act of appeasement, in which the citizen conscript army of the IDF was forced to expel by force her brethren, Jewish residents of Gush Katif, because they were Jews. But even this desperate act of appeasement, carried with it the quoted passages. How much lower has Israel sunk now, that it refuses to uphold even these lowly standards. Israel’s land-giving policy is not only a bad strategy to begin with, but the land given has been relegated to permanent unquestioned fact, regardless of whether the other side delivers on their promises or not, and this is now how contracts work in the normal world. respond to attacks in an unprecedented manner. We are taking this step (pullout) from a position of strength, not weakness. We have tried to reach agreements with the Palestinians that would drive both nations toward peace, but these agreements were shattered on the walls of hatred and fanaticism. The unilateral disengagement plan is Israel’s response to this reality. The plan is good for Israel in any future scenario. We are reducing the daily friction and victims on both sides. The IDF will redeploy along defense borders behind the security fence. Those who will continue to fight us will confront the IDF and the security forces at full force. Israeli leaders love to use the excuse of Israel’s strength for their weakness. Because Israel is so strong, it can withdraw, appease, surrender, and of course always “show restraint”. At some point one would hope Israel actually show its strength, or at least its willingness to use it before the last Jews in ancient Israel are pressed against the walls of Jerusalem surrounded by the all peace-obtaining territory given away to enemies. Israel must show there are consequences, negative ones that is, for attacking it. The military campaign against the strip cannot be against “tunnels” or any other military device or euphemism. The IDF onslaught must be against all its enemies in the strip, Hamas, Islamic Jihad and the rest of the terror groups. The army must be given free reign, within its moral rules of engagement of course (to not hurt civilians) to defeat its enemies. The arbitrary lines imposed on the army must be removed, where it cannot advance more than 1 km here, and 2 km there. Israel must first look for a total and decisive victory, peace paradoxically comes only after such victories, of either one side or the other. After such a victory, Israel can impose its demands, instead of trying to (illegally) negotiate with a terrorist group. It is of prime importance that the IDF not withdraw only to allow Abu Mazen and his PNA and Fatah to re-establish control of the strip. The IDF cannot be Abu Mazen’s foot soldiers, and this would be strategic folly. It should be clear that Gaza, much more Egypt oriented is quite different than the West Bank, with a large Israeli and Jordanian influence. Israel should stop fostering the myth of a “palestinian” entity, especially one that includes the Gaza strip and the West Bank, claiming the rest of Israel sandwiched between them. Gaza is at least the real name of a real Arab city, though in the past as was shown, it had a great Jewish presence, and its residents cane be viewed as Gazans, unlike the foreign and meaningless term of “palestinian”. The conflict has brought the term Gaza to large audiences around the world who had never previously heard it, and its separation from the West Bank’s PLO based authority should be encouraged and not restored. So what instead? Simple, Israel should first focus on total victory, which includes demilitarization of the strip. Searches should be widespread to remove all weapon caches in the strip, as well as to seize all Hamas leaders and assets. Hamas’ infrastructure including the smuggling tunnels should be destroyed, calmly carefully and thoroughly, AFTER Hamas has been defeated and not in the midst of combat. After these conditions have been established, a pragmatic, moderate local leadership should be raised up in each urban area. These should be people, respected within their communities and with neither Hamas nor Fatah leanings. They should take interim control of their communities, while Israel retains control of the philadelphia corridor along the Egyptian border (as is even stipulated under the trampled oslo accords) to prevent a re-armament, and then the IDF can withdraw from Gaza. The interim leadership can then deal with NGO’s and the international community for aid, reconstruction etc and the people of Gaza free to replace them and have any form of local government they want or don’t want to have. But in any event, it will not be able to rearm anymore due to the IDF’s control of the border. Paradoxically, the hated “siege” and closure of Gaza by Israel can be completely lifted. Once the enemy has been totally defeated, and the strip demilitarized, Gaza can be declared “open for business”. Gazans should be free to buy and sell across the Israeli border or the Egyptian border as they prefer goods from and to any country that wishes to engage them. The only thing Israel should do is keep weapons out, and allow any civilian good free access. Now the Gazans will have opportunity and an incentive to not cause trouble as opposed to the opposite. The partial closure of Gaza is due to Hamas’ rule of the strip, but if Israel topples it, then it is no longer needed. Israel should also declare firmly that while the strip can rule itself as it wishes, that any breaches will be met with stiff consequences including territorial consequences, and the return of the IDF into the strip. Gaza cannot become a safe heaven for terrorists as it is now, and if terrorists are once again harbored in the strip, the IDF will go get them. With the strip demilitarized, this will not mean war and destruction like it does now, but rather police actions (as happens in areas of the West Bank), as long as Israel is able to maintain the demilitarized state. Other red lines should be declared as well, for example certain environmental transgressions should allow the IDF to stop them. It should be made clear that nothing guarantees a juden-free strip, and Jews who end up legally within the strip, by either purchasing land, on business or pleasure, cannot simply be murdered because they are Jews. In another example, the common spillage of sewage water into the Mediterranean coasts, or excessive pollution from factories, but as long as Gaza does not invade Israel’s environment, re-arm or sponsor terrorism, it can be allowed full freedom and to rule its own affairs. Ideally, with time, fuller negotiations can reach to deeper understandings, Egypt should allow its fellow Arabs and Muslims access to the rest of the country to alleviate overcrowding of the strip, but all that in due course. The objective at hand is simple, there is an enemy, a relatively weak one at that, who must be vanquished; Israel has forgotten that wars are ended by someone winning them. Israel’s current path is exactly the opposite of this straightforward and simple strategy, expensive, deadly, massive and useless air campaigns, toleration of endless shelling of her cities… abuse of the army and reservists’ lives by sending them into mortal danger with absurd limitations on defeating the enemy… this must stop or Israel faces a very bleak future indeed. In another article, I made the case for territorial consequences, and the re-establishment of Gush Katif, this would be amazing, but with the low expectations that exist from today’s Israeli political scene, this modest plan would be great as well. While Israel and the world keep arguing in circles, Hamas is not confused, it keeps fighting, knowing with determination one day it can win…. well it is confused only in one aspect, disbelief at Israel’s refusal to win. I don’t disregard our enemies’ courage, if our leaders acted with one tenth of theirs the war would have been soon over with a tenth the casualties on both sides…. but now I beg the Israeli leadership, Bennett, Lieberman, Saar, Bibi, Shamir, Yaalon, and the rest who are brave and patriots, please let the IDF, bursting with heroes, loose on our enemies who would have us massacred and enslaved; let us defeat them, for we would only have them unarmed, and free to live their lives, as long as they are not based on ending ours. Please I beg of you, there is only so much defeat our warriors can take, while still remaining unconquerable.